Lucy In The Sky is quite prim and proper for a glitter polish, but look at those aqua and blue specs! I didn't go for a full coverage this time. Only two coats were applied because I didn't wanna suffer too much later on (and I didn't, thank God!). It's the weekend, so I will show you some more pretties that I recently found from a Bloomingdale's outlet that opened up in my neighborhood. 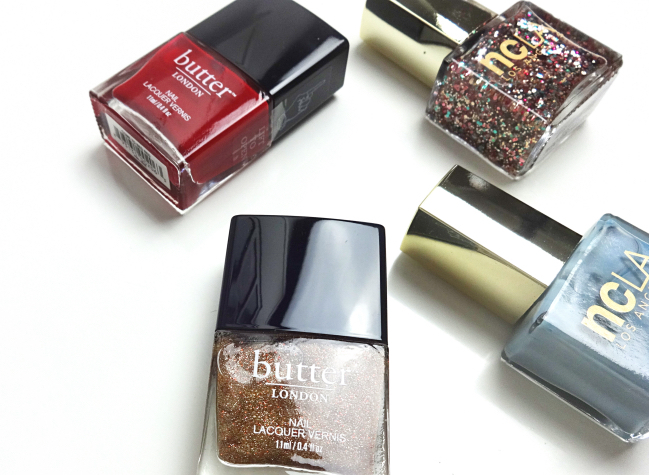 I got a Butter London polish set which includes my all time favorite red creme polish ever, Come To Bed Red. Plus freebies from NCLA. Another one because they are pretty. 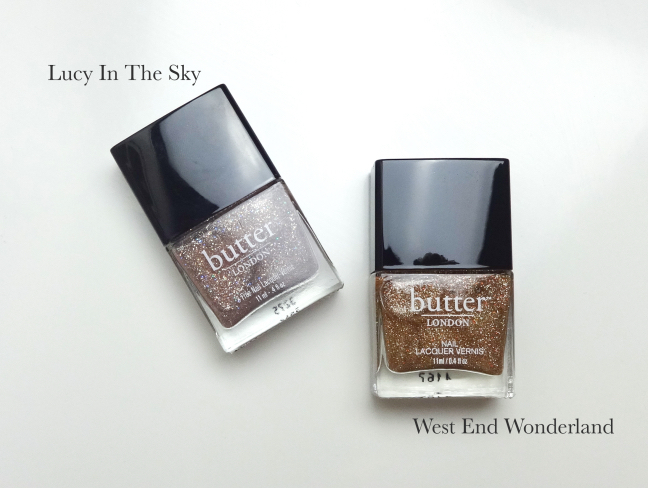 West End Wonderland, the glitter polish from the set is more of a true gold maybe with a hint of khaki. We will see how that plays out on nails. Hope you enjoyed this quick post. 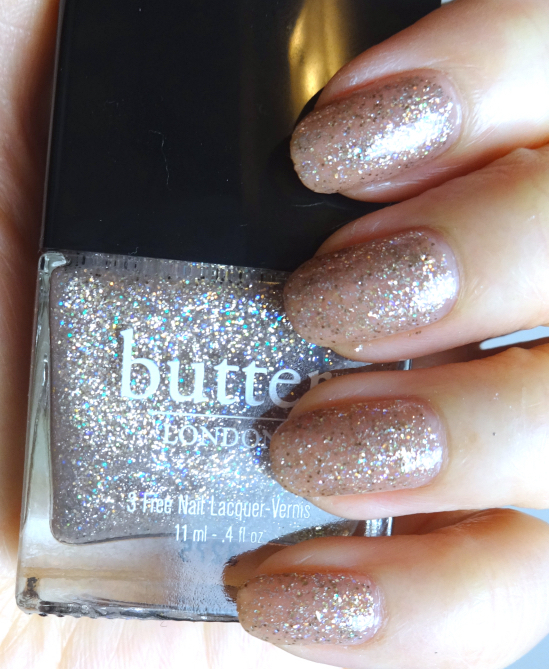 I've been really interested in glitter polish recently ('tis the season, I guess), and this is one I never thought I needed: a glitter in a neutral color! I like that it can function as a topcoat or on its own. Lucy In The Sky is a wonderfully versatile as you said. It is a nice alternative to those boring pale colors which are quite difficult to pull off in colder months anyway. I only wear glitter nail polish once a year which is this time of the year for Christmas and then suffer through the removal process. 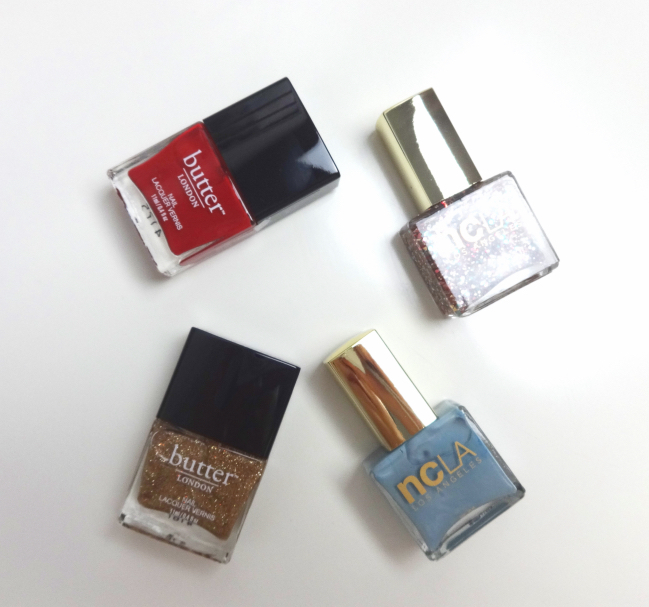 I don't think I've used Butter London nail polish before, how's the quality and longevity? Do they chip within a few days like Ciate? Sorry for the questions but I love nail polish and I have an addiction for it like lipsticks. LOL! I really like Essie polishes for myself. Haven't bought any Dior in years because the brush shape is not ideal for me, but I believe the shades and the formulation are superb! Christmas is the best time for glittery nails, isn't it! They're a pain to take off but it's well worth it when you find the right shade. My pick out of the bunch would be West End wonderland because it looks gorgeous! Would love to see the colour on you. LOL. He must miss you more everytime he sees something like that around the house! It's so PRETTY! I love glitter polish-if I only wore polish hahahaha! I see what you're saying. LOL! But removing them is a pain in the a** , lol. Lucy in the Sky is so pretty!! Love the look of Lucy in the Sky! I love that it's a neutral glitter. Those two words usually don't go together, but this polish does it perfectly! Lucy in the Sky is so pretty. I got this one a few years ago and remember wearing it as an accent nail for a long time. Then Butter London left Germany. I don't know what happened, it is really a pity, they had very fun shades. Sorry to hear it's not easily accessible for you!